Paediatric speech and language therapists are challenged by diminished resources and increasingly complex caseloads. The new edition addresses their concerns. Norms for speech development are given, differentiating between the emergence of the ability to produce speech sounds (articulation) and typical developmental error patterns (phonology). The incidence of speech disorders is described for one UK service providing crucial information for service management. 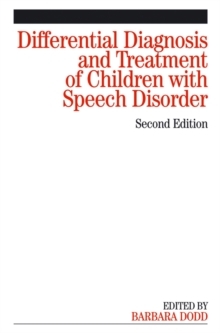 The efficacy of service provision is evaluated to show that differential diagnosis and treatment is effective for children with disordered speech. Exploration of that data provides implications for prioritising case loads. The relationship between speech and language disorders is examined in the context of clinical decisions about what to target in therapy. The final section of the book deals with special populations: children with cognitive impairment, hearing and auditory processing difficulties. The needs of clinicians working with bilingual populations are discussed and ways of intervention described. The final chapter examines the relationship between spoken and written disorders of phonology.